Hosana Bezerra's paintings are exciting and contemplative. His unique art style is a reflection of the modern world we live in, with references to nature and architectural masterpieces from world-renowned artists, such as Le Corbusier and Oscar Niemeyer. In his art, geometric shapes, perfect lines and balanced colors play with the eyes. His paintings tease the imagination, allowing people to find meanings of natural and man-made monuments within them. Every stroke is calculated and placed in precise sections that respect the limits of each corner of the canvas. Depth is achieved in each piece with its play of positive and negative space. Hosana Bezerra was born in 1957 in Recife, northeast of Brazil, where he lived a modest lifestyle while growing up. He moved to Brasília 20 years ago seeking a better life. He worked as a gardener and signage designer before he discovered that his creative talent had a space in the art world. 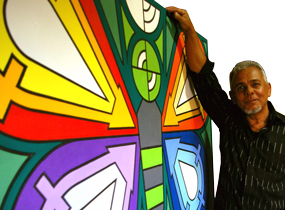 As a gardener he became sensitive to nature and as a signage designer he learned the concepts of geometry and color theory. In the last six years, he has sold paintings to congressmen, senators, diplomats, art collectors and people of all ages who appreciate his artistic expressions.